You may have heard that there are new regulations concerning silica dust have been established by the Occupational Safety and Health Administration (OSHA). If you are a contractor who engages in activities such as cutting, grinding, finishing or blasting materials like concrete, stone and brick, you are likely creating silica dust (or, as it is also known, respirable crystalline silica). This dust creates a health hazard for workers if the right precautions are not followed. OSHA’s stricter standard goes went into effect on June 23, 2018 (general Industry and June 23, 2017 (construction), so as part of our ongoing effort to keep our customers informed of important industry updates, we put together this briefing with details and resources. Since so many Diamabrush tools are used for grinding and polishing concrete, as well as generating potential silica dust, these regulations are essential knowledge for our customers. Who is most at risk for silica dust exposure? 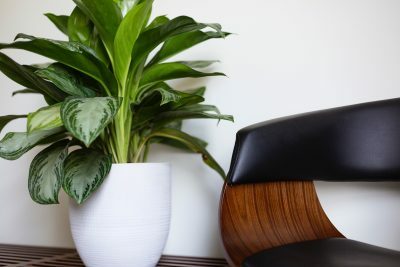 most affected by the new regulations, because of the dynamic nature of the industry and environmental factors, such as wind and humidity, can increase employee exposures. 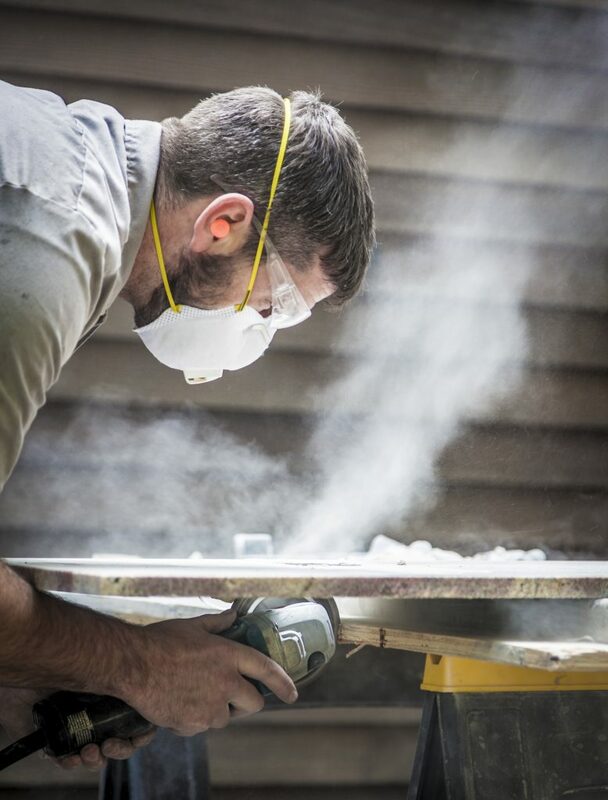 Additionally, construction companies may find it more difficult to use some of the controls found in Table 1 to control silica dust when weather conditions are less than ideal. Using wet methods to control dust in the winter can introduce a new hazard such as ice to the construction site. How big of a deal is this, really? There have always been standards regarding silica dust containment, but they’re regulation is more serious because of the long-term health implications of silica dust exposure. At the end of the day, we have the tools and technology to get in front of this problem to protect our employees, so let’s do it. Contractors need to obtain an initial assessment of how much silica dust their operation is creating. An assessment reading below the level of 25 micrograms means the company is not required to provide medical tests, develop a written plan, or undertake any of the suggested engineering controls. Readings above 25 micrograms will need to instate these controls, which might include providing workers with respirators and either wetting work down with tools like a wet saw or using a vacuum device to reduce the volume of dust. To ensure you are taking the right steps, we suggest contacting a trade association like the Associated General Contractors of America. They can help demystify the regulations and help you develop a detailed plan. Workers’ compensation insurance carriers and safety consultants are another good resource. They can help contractors review the situation, assess worker exposure, and conduct training, The cost for these services is typically part of premium payments. Of course, OSHA is also an excellent resource for contractors, particularly small and medium-sized ones. They offer a free Small Entity Compliance Guide from their website, as well as other tools. Be sure to visit their site to review the complete regulations pertaining to your industry and small entity compliance guides. What happens if you don’t follow these new OSHA regulations? While the regulations are a clear indication of the serious potential health hazards for any workers who might be exposed to high levels of silica dust, there are also serious financial risks for contractors as well. Violators of the new OSHA silica dust standard will be subject to a maximum fine of $12,934 for a serious or other-than-serious violation. There is then a fine of; $12,934 per day for a failure-to-abate violation past the abatement date, as well as a $129,336 for a repeated or willful violation. Obviously, preparation for readiness to comply is in the best interest of every contractor, as the implications are serious, especially for small-to-medium sized businesses..
Diamabrush has always made safety a priority for our customers. Indeed, long before these regulations came about, we developed some wonderful tools and accessories that reduce risk of hazards and can assist in OSHA compliance. For contractors, using a dust shroud that minimizes dust in the air is the easiest way to ensure you are following the OSHA guidelines. Our 5” and 7” dust shrouds are available at Lowe’s and Sherwin Williams for use with our concrete hand tool and wood decks and siding tool. 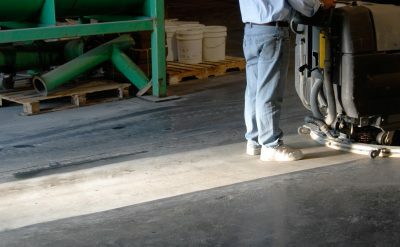 Facilities operators also should know that cleaning and polishing concrete floors also has the potential to kick up silica dust. To minimize that dust and to be in adherence to OSHA’s regulations, use industrial tools such as our Deep Scrub tools, In addition, our Removal, or Polishing tool systems use water to ensure a clean, dust-free operation.